Amritsar: The railways has decided not to hold a probe against the driver of the DMU that was involved in the Amritsar rail tragedy. Meanwhile, Divisional Railway Manager Vivek Kumar refused to hold a probe into the accident and termed it a run-over on a largescale. He said the people standing on the railway tracks amounted to trespassing and that the railways had not got any case registered. He said the driver was not at fault as the train was being driven on the major Amritsar-Delhi railway line, which is supposed to accommodate trains running at 110 kmph. Meanwhile, plying of all trains from the Amritsar railway station has been withheld subject to security clearance from the state government. Security has been beefed up in and around the railway station to avert any untoward situation arising out of the possible protests by people. As per the train speedometer, the DMU was running at 91 kmph when the accident took place. During the accident the speedometer also got damaged. Railway officials refused to reveal the identity of the driver, who said that after noticing the people he applied the brakes to bring down the speed but it was too late. There is a manned railway crossing nearby called Jodda Phatak as twin railway lines--Amritsar to Jammu and Amritsar to Delhi–meet here leading to the Amritsar railway station. People say the gateman could have alerted the authorities after seeing a large number of people gathered over the railway tracks. On Saturday, as a precautionary measure, the gateman was removed from the level crossing and armed guards of the Railway Protection Force were guarding the railway installation there. At the accident site, an irregular boundary wall was seen on both sides of the railway lines to separate railway tracks from the residential localities. He said that the driver after noticing the people over the tracks applied the brakes and brought down the speed to 68 kmph but the damage was already done. He ruled out any mistake of the gateman saying the accident site was about 400 metres ahead of the level crossing. He said the duty of the gateman was to manage the gate; besides, the accident site was not properly lit and was not clearly visible from the level crossing. 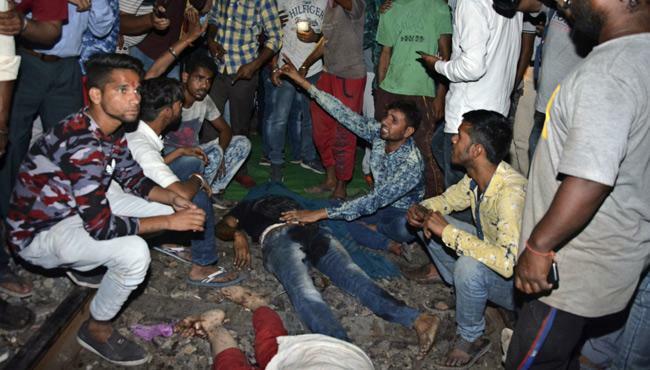 The Government Railway Police (GRP) on Saturday registered a case against unknown persons in connection with the Amritsar tragedy. A case has been registered under Sections 304 (punishment for culpable homicide not amounting to murder), 304A (causing death by negligence) and 338 (causing grievous hurt by act endangering life or personal safety of others) of the IPC, a GRP official said. SHO of GRP railway station Amritsar Balvir Singh said the FIR has been registered against the unknown persons and names of the accused would be added in the FIR after investigation. "It is too early to say anything about the accused (or) who was responsible for the mass killing on railway track. But during the course of investigation, many facts and causes are expected to come to light. Investigation will be conducted to find out the causes and lapses that led to the killing of so many people," he said. Singh said the GRP was informed by Punjab police personnel about the incident and they immediately rushed to the spot. "We found bodies of many people, including women and children. We extended all possible help to shift the injured people to different hospitals and assisted the administration in the rescue operation," he said. Asked about the driver of the train, Singh said he has not been arrested as he has not been named in the FIR.